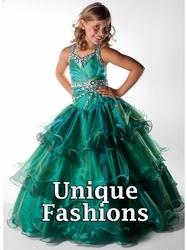 Moms choose Pageant Designs not only because we are a reliable online pageant site. 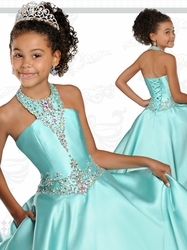 With a beautiful and elegant pageant girl dress; Moms know that their sweet diva will steal those judges' hearts when she steps out on stage in one of our chosen designs. 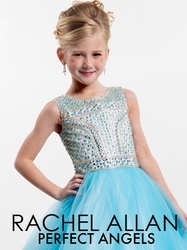 Our girls' pageant dresses are designed to complement her natural beauty and enhance her grace, poise and confidence. This glittering collection of little girls' dresses offer a dazzling variety of styles that you won't see elsewhere. From sassy off-the-shoulder frocks to dramatic full-length gowns with sequined bodices, our glamorous pageant dresses are from leading designers like Tiffany, Rachel Allan , Ritzee Girls and Little Rosie . 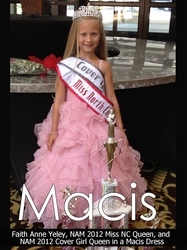 For budding little princesses, Mac Duggal child pageant dresses are offered in their Sugar line. This high-end designer of women's special occasion dresses creates extraordinary gowns for little girls that are as exquisite and finely detailed as their grown-up counterparts, with soft chiffon, ruffled tulle and elaborate designs of AB stones, crystals and sequins. 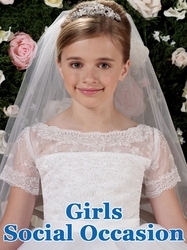 Little Rosie and Ritzee Girls specialize in little girl short pageant dresses that will instantly capture hearts. Elegant fabrics and embellishments abound, like full organza skirt ruffles and beaded tops, embroidery, stones and jewels. Our baby and toddler pageant dresses have ruffled skirts and rhinestone embellishments that will make your little girl look and feel like an enchanting fairy princess. Whether it's a beauty pageant or another special occasion, she's destined to rule the world with her sophistication and style, and we're proud to be a part of that wonderful experience.